Tomorrow’s App O’ The Mornin’ will be Roll Through the Ages, but I thought I’d get a jump start on that review by talking a bit about the original game. 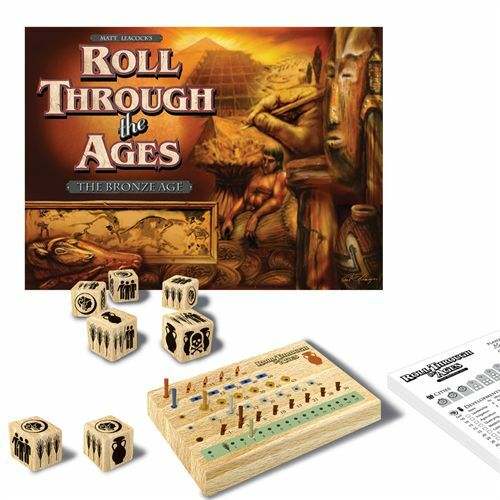 Roll Through the Ages is a fast-playing, dice-based version of a very long, complex civilization game called … yeah, you’re already ahead of me on this one: Through the Ages. I am not one of those people who hate Yahtzee. It’s an okay game, and the app version can be addictive. Roll Through the Ages, however, does something quite interesting with the dice rolling formula. The game comes with 7 special dice. Each die has the following illustrations: 3 sheaves of wheat (representing food), 3 people (workers), a coin (7 gold pieces), a jug (goods), two jugs with a skull (2 goods + 1 misfortune) and 2 wheat with 2 people (you can choose 2 food or workers). Everyone gets a score sheet that shows the cities, monuments, and developments that you either already have, or can build by rolling dice. They also each get a peg board (similar to a truncated Cribbage board) that allows them to track their goods. Players start out with 3 cities, allowing them to roll three dice. They get three rolls each time, and can “save” good rolls, just like Yahtzee. They need to roll food to support their cities, workers to build more cities and monuments, and goods and money to buy civilization developments (which provide bonus points and in-game benefits). As you build more cities, you get to roll more dice, up to 7 dice total. Each worker you roll allows you to check off various boxes on your score sheet. Check off enough boxes for a particular item (such as The Great Wall or a new city) and you’ve “built” that item. Although the rules for counting, spending, and discarding goods are bit tricky at first, they soon become second nature. Final points are scored based on monuments and other bonuses, with high score winning. None of this should work at all. Even writing it down makes it sound more complex than it really is, and the idea of a civ-building dice game sounds loopy. The real accomplishment of designer Matt Leacock (of Pandemic and Forbidden Island fame) is taking the heart of the Civilization genre and, through some weird bit of alchemy, converting it to fast-playing, dice rolling fun. I know an innovative (and tricky) design when I play one, and this is as innovative as Pandemic, albeit in a subtler way. It’s not a “simple” game, but my 9-year-old daughter grasped it perfectly well, and is even beginning to work out some advanced strategies. It can be explained to a novice group in about 10 to 15 minutes, and takes about 30 minutes to play, making it a great light game for both experience and novice gamers alike. It’s also fine as a solitaire game. UPDATED 6/9/11: This review originally included a photo I assumed was a publisher shot because of its professional quality, but which was actually created by a reviewer from BoardGameGeek named “EndersGame”. I have removed the image, but it can be found here, along with many, many more detailed photos of the game. It’s quite an excellent post, and well worth your time. This one took me completely by surprise. Expecting some kind of mindless action game or dungeon crawl, I instead found a remarkably clever and even innovative puzzle game with an appealing style and easy wit. Helsing’s Fire pits Dr. Helsing (he’s lost his Van) and his Jeeves-like manservant Raffton against Dracula and his army of skeletons, werewolves, bats, robots (? ), and other nasties. The visual style is so deliberately like the art of Hellboy creator Mike Mignola that it’s clearly meant as an homage, as is the dry wit and banter among Helsing, Raffton, Dracula, and the various minions they encounter. The narrative is just a linking device for levels, but it manages to be quite entertaining. Gameplay is unlike anything you’ve played before. This isn’t an action game in which you dispatch foes with weapons and quick reflexes. It is, instead, a clever puzzle game that revolves around the correct placement of Helsing’s torch. 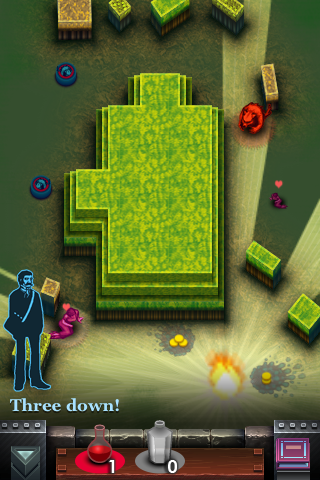 Each level is see from the top-down, and consists of various solid obstacles, enemies, and bystanders. The torch throws a killing light across the entire map, except where obstacles create shadows. This light can also be modified by color potions. A colored torchlight will only kill an enemy with the same color. If it strikes an enemy with a different color, it raises a shield. If it strikes a bystander, you lose. Since you have a very limited number of torches and potions (often one per level) the entire game is based upon finding just the right location to trigger the torchlight. It’s a remarkable, completely fresh puzzle mechanic. Torch placement and triggering is done with simple gestures, and each level can be defeated in as little as a few seconds. The trick is managing your resources and finding just the right placement. If you’d like to see regular updates, please join us on Facebook, Twitter, or an RSS feed. The new State of Play Twitter stream is called StateOfPlayBlog. You can subscribe to the RSS feed here or by selecting an RSS feed from the sidebar.